Hi guys! I'm super excited to be with 8 amazing bloggers and Instagram friends for a link party on how to incorporate vintage pieces with your modern day purchases. At the end of my post you'll find links to visit my friends blogs to see their posts! We would also love for you to link up your post for a chance to be featured on one or more of our blogs next month! 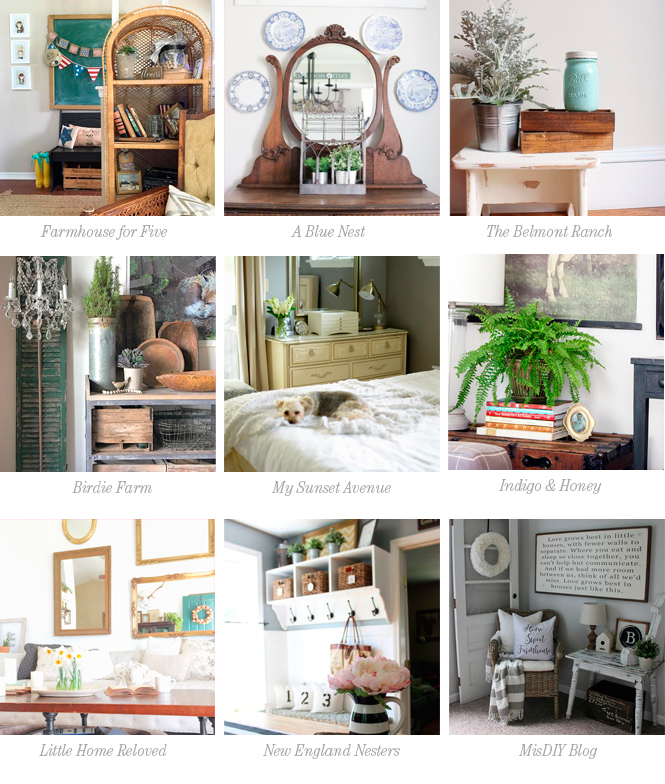 Plus, we would really love to visit YOUR blog to see how you achieve this in your home. 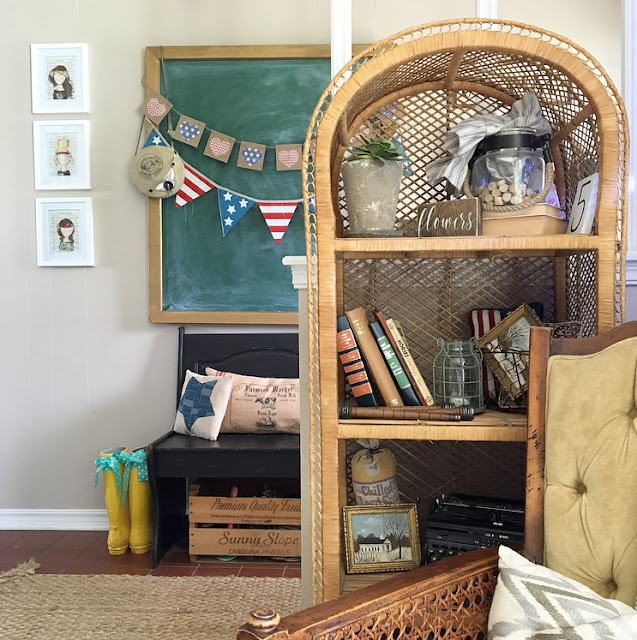 It's no secret I love anything and everything vintage! Especially in my decor. I am constantly stopping by the local flea market to check out new (but old) treasures! I try to balance my new and old decor together the best that I can. 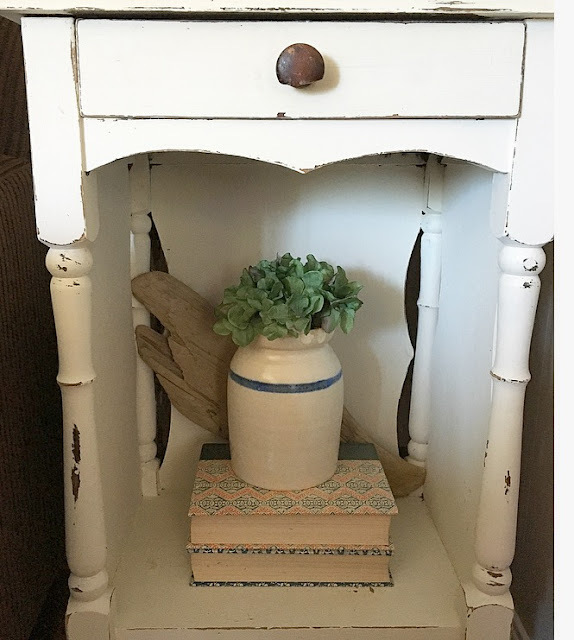 I usually stick with the main vintage pieces that I love so that guests don't feel like they are walking through a time machine when they enter the front door...maybe some do though! That's OK by me though! 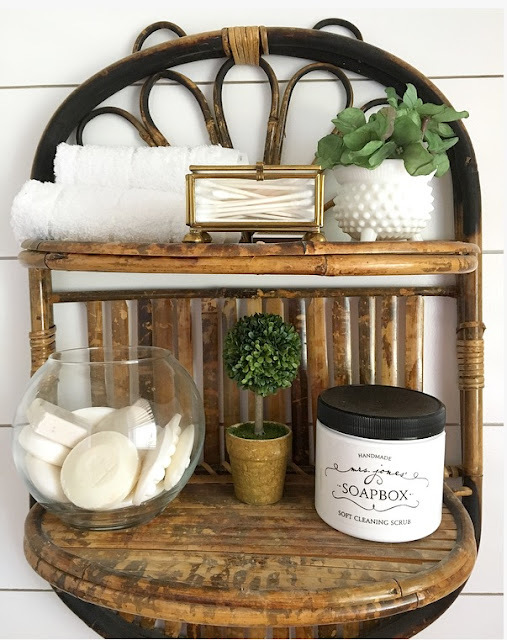 I have always decorated with things I love and that make me happy, regardless of what's "in style" or what the 'design rules" say you should and shouldn't do. I'll share with you what pieces I love to look for when out shopping and how I incorporate them into my decor. First up..Milk Glass! 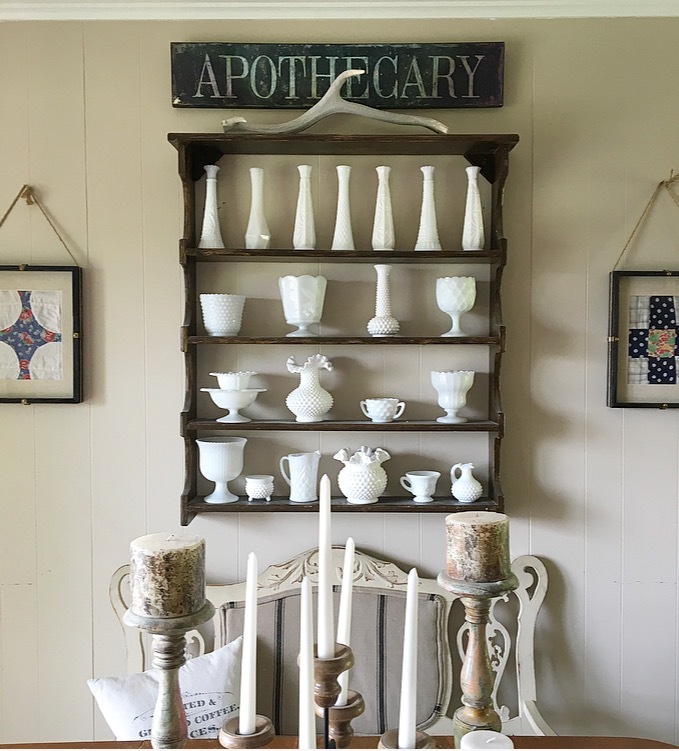 It's probably safe to say I have a milk glass addiction! It's one of my favorite things to grab at the flea market or garage sales. 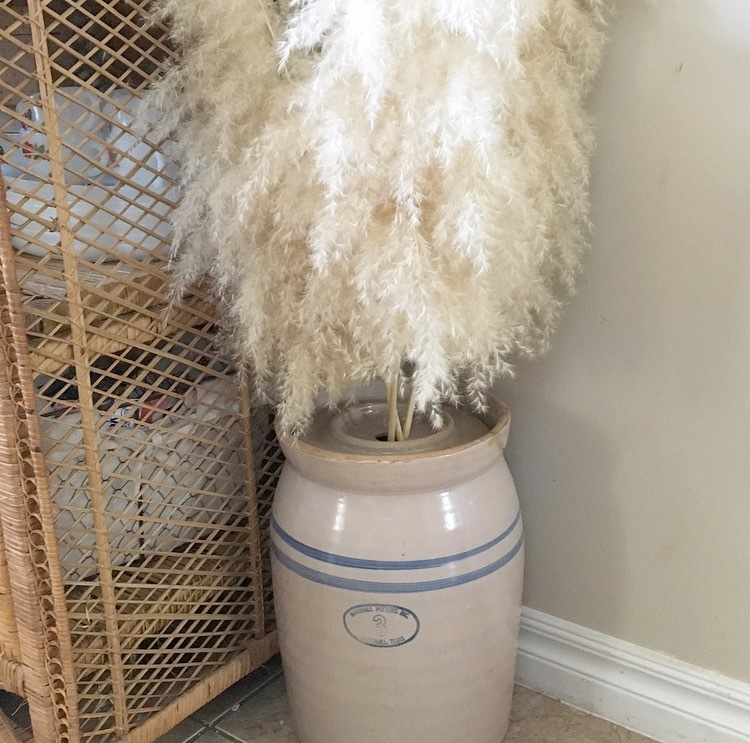 Usually you can find vases like these below for under $5 a vase. 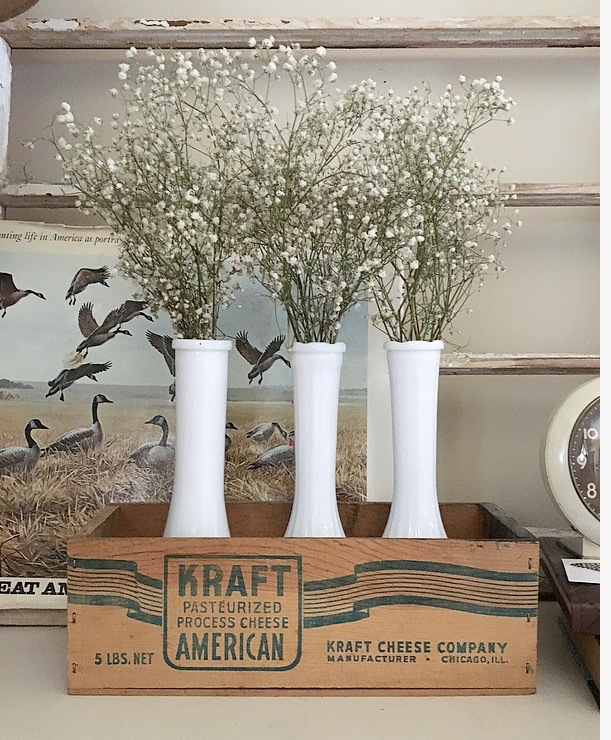 Above I have them in an old cheese box setting on my nightstand with some simple baby's breath in them. I also tuck the smaller ones inside my three-tier tray. 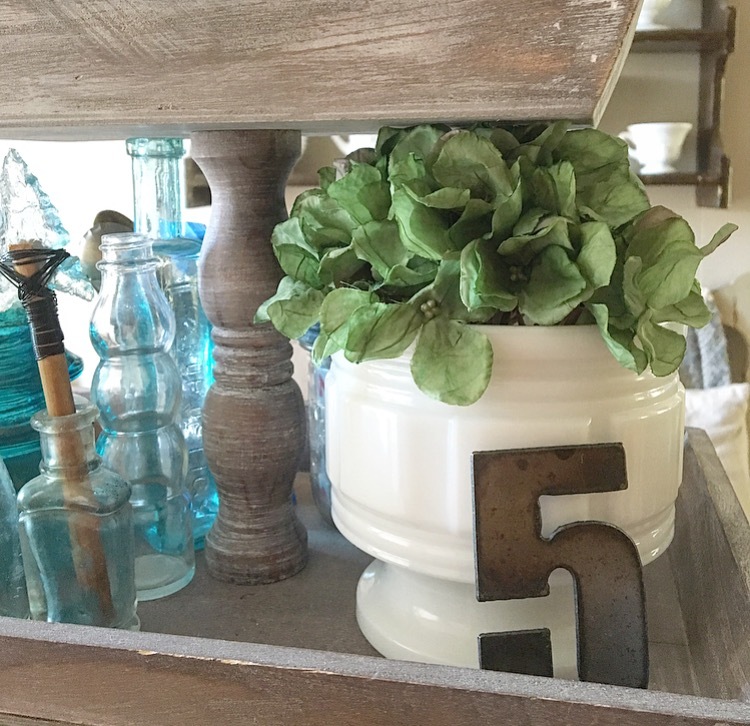 They are perfect for planting small plants in or for using faux plants...like I did here. My favorite spot in my whole house would be my dining room. The wooden shelf also came from a flea market and it was bright yellow when I brought it home. 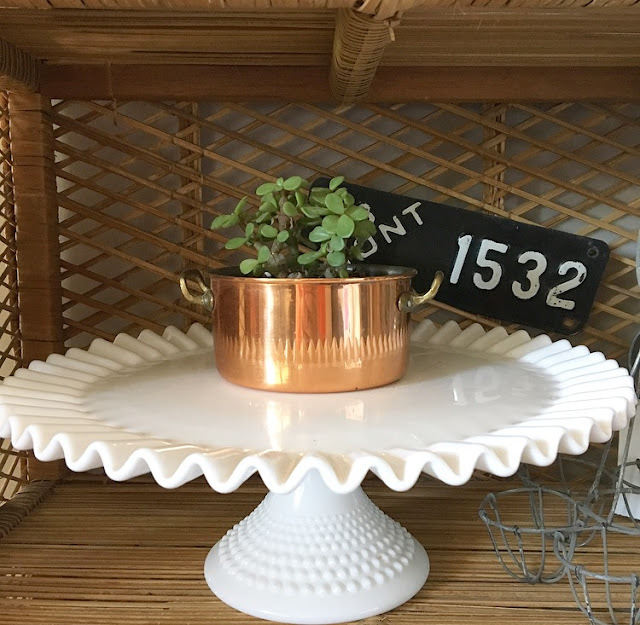 I gave it a coat of brown and used it to hold my favorite milk glass pieces. I love the contrast between the dark brown and the bright white. This hobnail cake stand belonged to my husbands grandmother and is also a favorite. 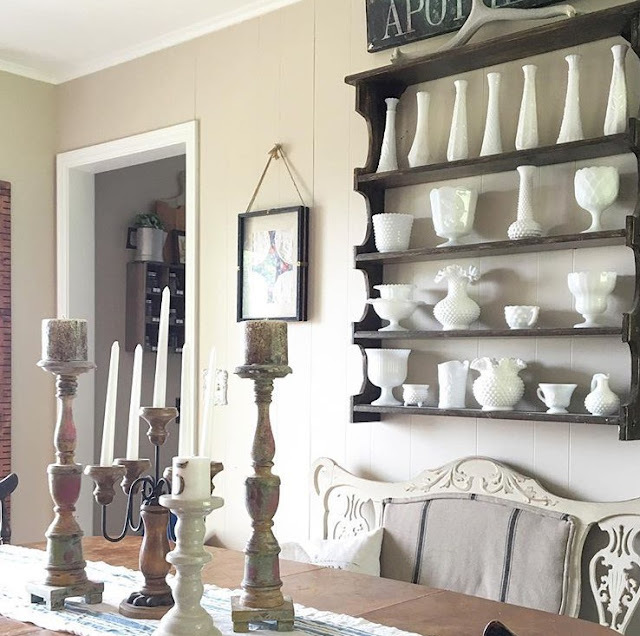 Small milk glass pieces are great to fill space as well. This vintage rattan shelf I used in our bathroom remodel has small shelves so I had to be selective on what I put on them. 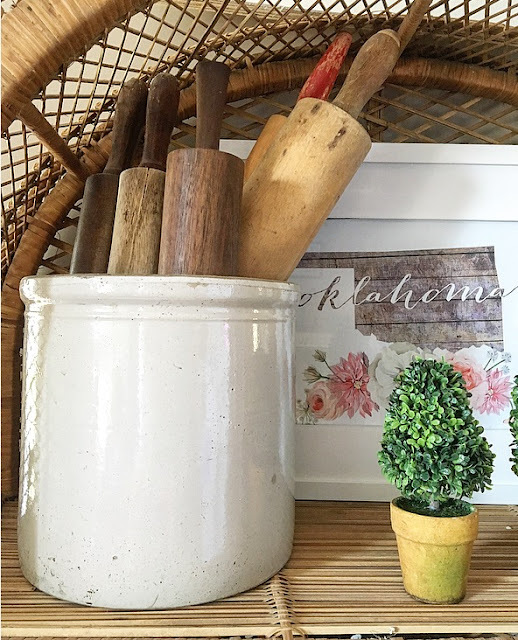 This tiny hobnail vase was perfect! I absolutely cannot turn down a crock that's priced right when I come across them. To me they scream farmhouse! I use this medium size one to hold my vintage rolling pins. I have this smaller one tucked inside an end table in my living room. The ones with numbers and stripes are my favorite! 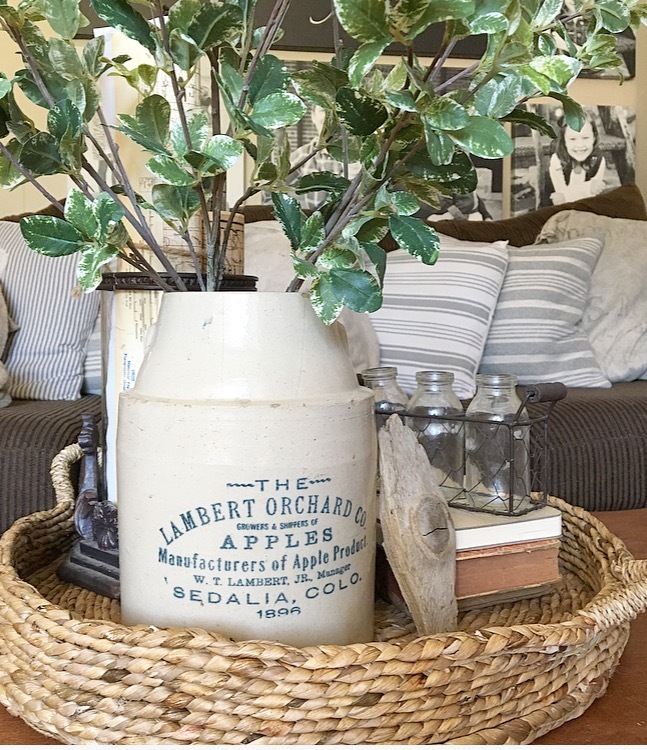 My favorite one of all is this "Lambert Orchard Co." crock I came across at a small antiques store while traveling through Texas. I added it to my tray on my coffee table and stuck some faux branches in it. Can you tell I love faux plants yet?!? Real ones don't stand a chance with my black thumb. My biggest one is actually an old butter churn. 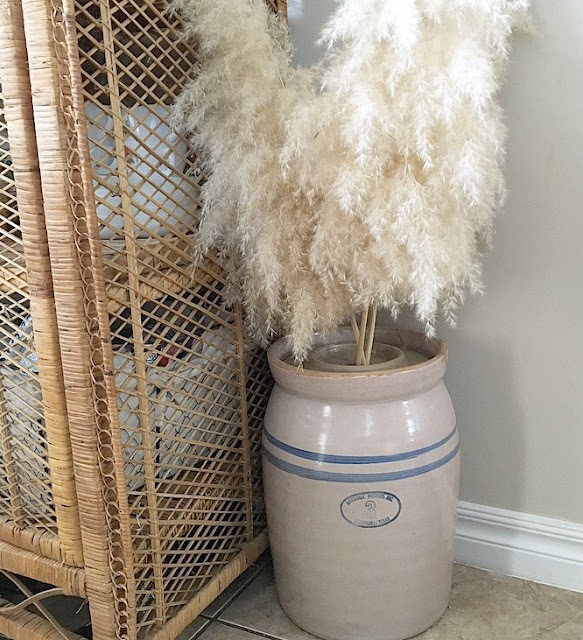 I stuck some Pampas Grass stems in it. Thanks for stopping by! 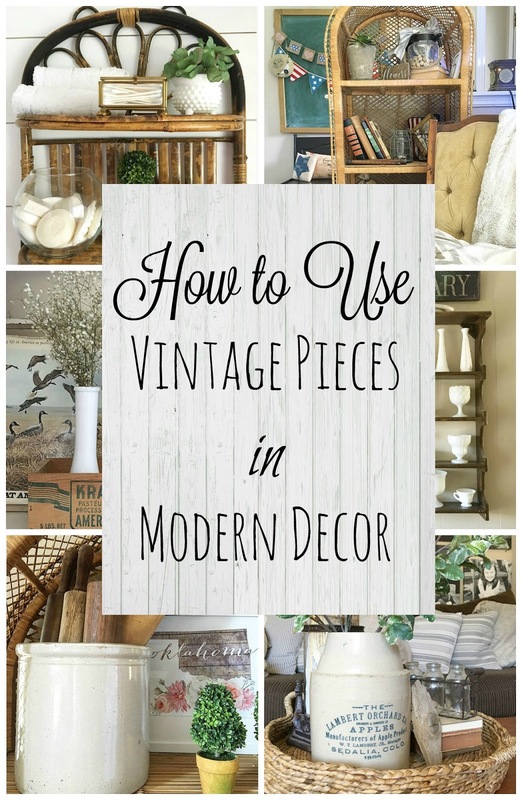 Be sure to tune in next month for more of how I decorate with vintage pieces. Also, check out the links below for some major inspiration! Love all of this Daraka! Looks like our vintage loving hearts have a lot in common, I also have a little collection of milk glass and crocks AND I pretty much have the exact same set up with the crate and baby's breath! 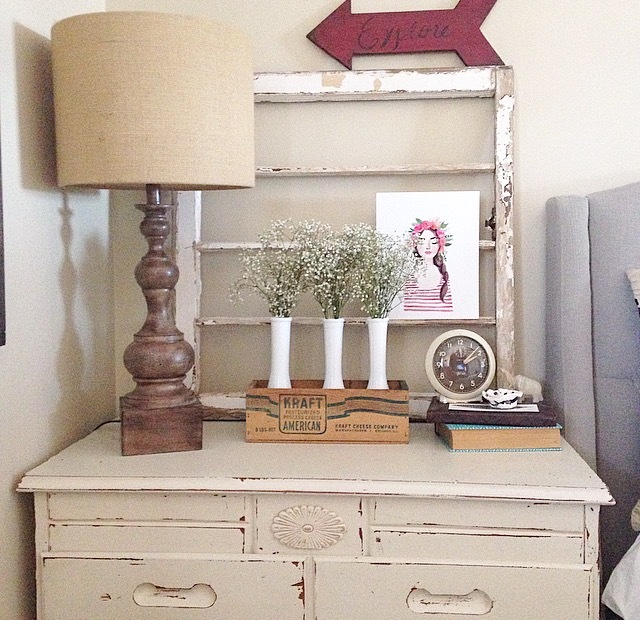 lol....you're home is so stunning and I love the way you perfectly mix in your beautiful unique vintage pieces! Absolutely gorgeous, Daraka! I love your mix of vintage pieces. You've created such a lovely home!! And your milk glass collection is amazing! I am in love with your milk glass! You have so many! I have started to collect, getting some here and there and I love them. I also have an obsession for crocks, just have to find them at the right price hehe. Where do you get baby's breath?! I love how they look in the vases. And the rolling pins!! Eeeeeeee! I giggled when you mentioned people walking in your house and thinking it's a time machine. People always ask where I get all of my vintage finds, I bet they are thinking the same!